For this year’s champion project, it’s a case of location, location, location. 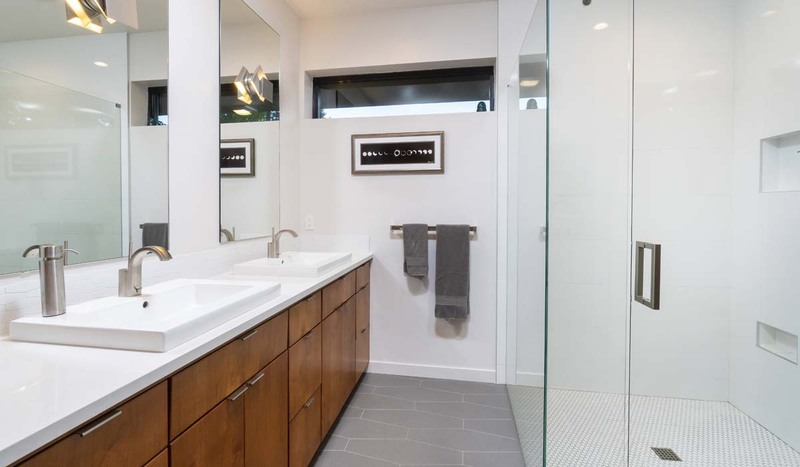 By the time Gretchen Rowe decided she wanted a green home, she had all the details worked out. 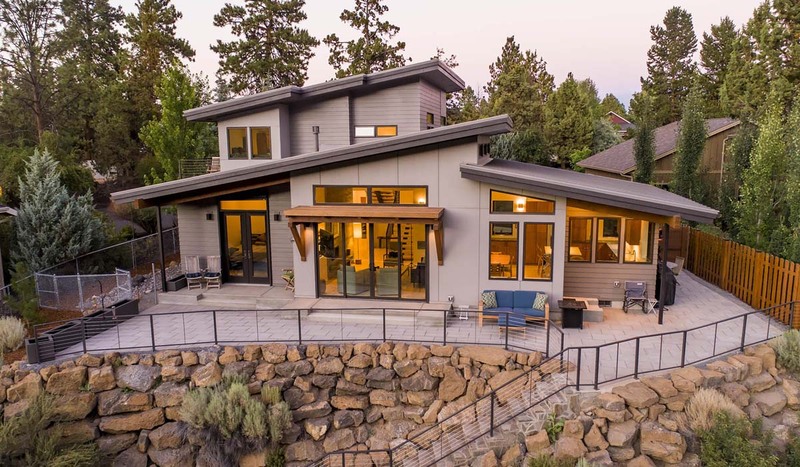 This made building it easier—yet highly challenging, according to designer Jason Offutt of The Shelter Studio in Bend, Ore.
Rowe and her husband, Rodney Toogood, had selected a lot along the Deschutes River as the site of their new home, and had a specific set of parameters in mind for anyone who built the structure. As it turned out, the property owners were considering expanding their garage, and splitting the lot would make that possible. That put the parcel in Rowe and Toogood’s price range. Name: Rowe Toogood, Bend, Ore.
Bend’s higher latitude would make that difficult, Offutt notes. “In our climate and latitude, the sun is encouraged into structures during the day and typically diminished in the afternoon, to not overheat homes in the summer, unless there is a view to the west,” he says. Other parts of the home also were designed with this goal in mind. 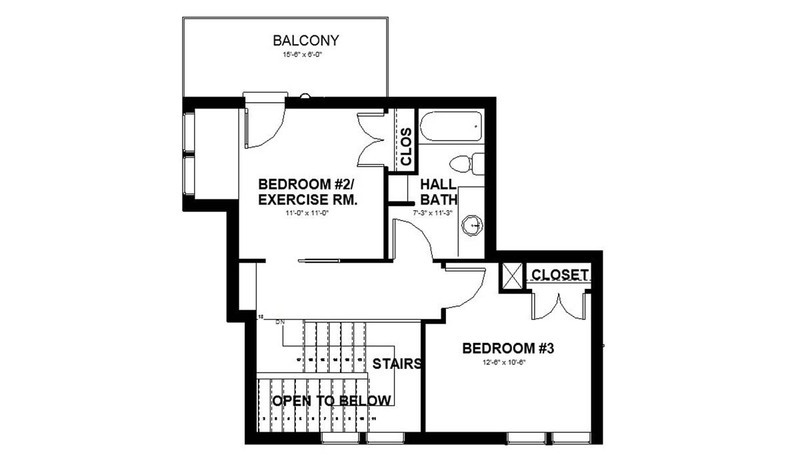 The upper-level spaces—including an exercise room and master bedroom—are oriented to the north, to not overheat during the day, while retaining their views of the river. The sun was contained in other ways. 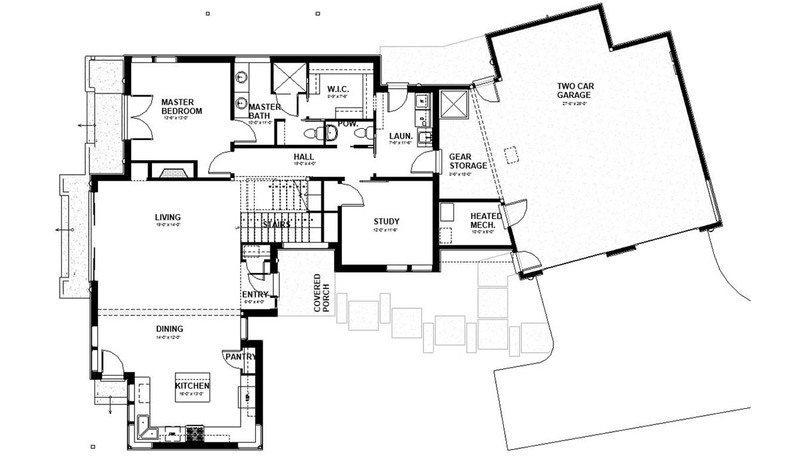 At the main level, the kitchen, dining and living area are oriented to obtain passive solar gain during the day. Sun shades were added to help block the sun externally for western windows, without blocking the river view. Even the stair core is located to obtain passive solar gain throughout the day, using the sun to illuminate the stairs and halls. 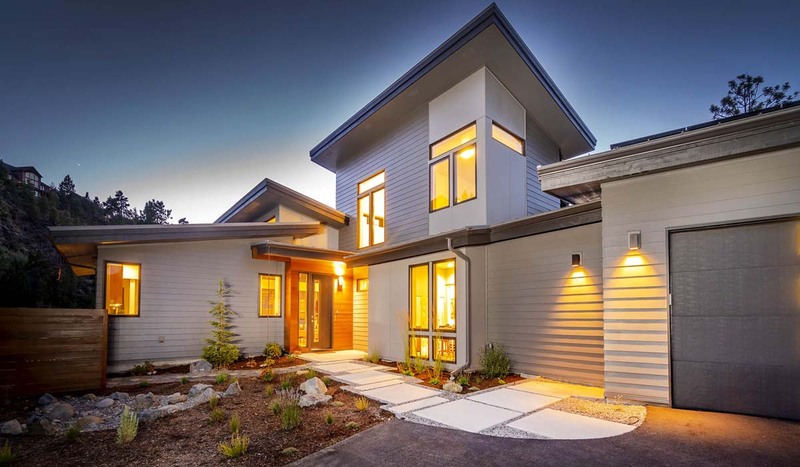 Energy-saving efforts are on display throughout the house: LED lighting, Energy Star-certified appliances, premium heating, ventilation and air conditioning (HVAC) venting, triple pane windows and insulation. Lots of insulation. There are high insulation ratings everywhere: R-38 behind the tub and shower, R-39 for exterior walls and subfloor, R-25 batts in rim joists, R-58 in vaulted ceilings, R-50 in attic spaces, R-21 in exterior walls of the garage, R-30 in the garage ceiling, and R-9.4 at the headers of the exterior doors and windows. The exterior walls feature staggered studs at 10 inches thick to offer the best R-value, according to Offutt. On the metal roof, LG Solar LG 305 NeON panels provide necessary full power to the house, when the sun is shining. 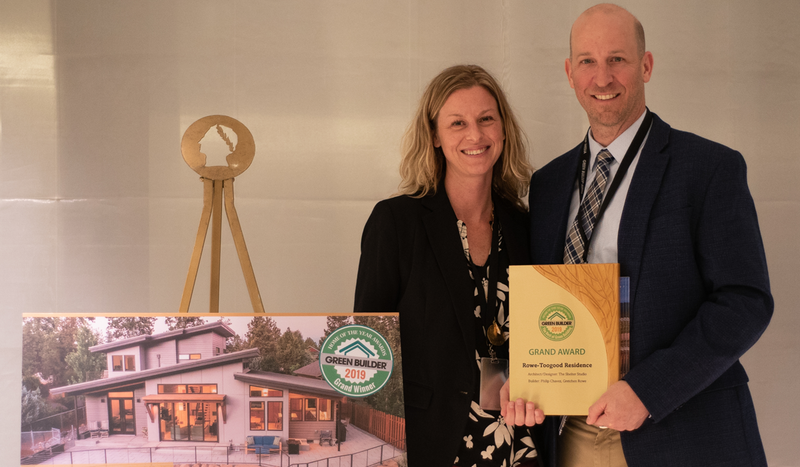 The final result is a home that met Rowe and Toogood’s energy goals—the Energy Trust of Oregon gave the house an Energy Performance Score of 8 out of 10, noting that is complements adjacent homes and the overall neighborhood, according to Offutt. 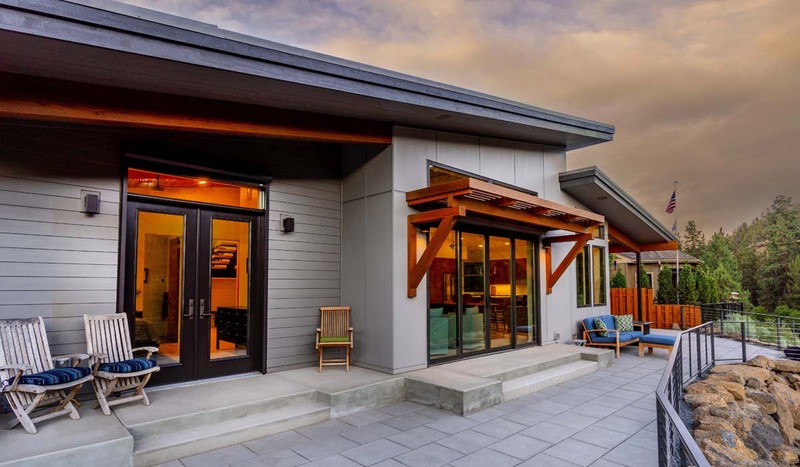 Rowe and Toogood also desired exterior materials that complement the northwest material palette, and were as low-maintenance as possible. 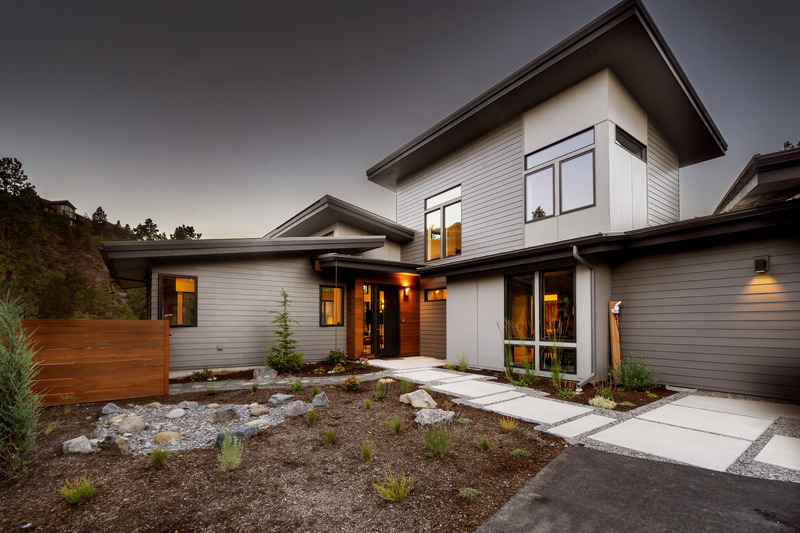 James Hardie fiber cement products were used for siding, and northwest Douglas fir elements were brought in as accents, with a deep staining and sealant to preserve from sun exposure. 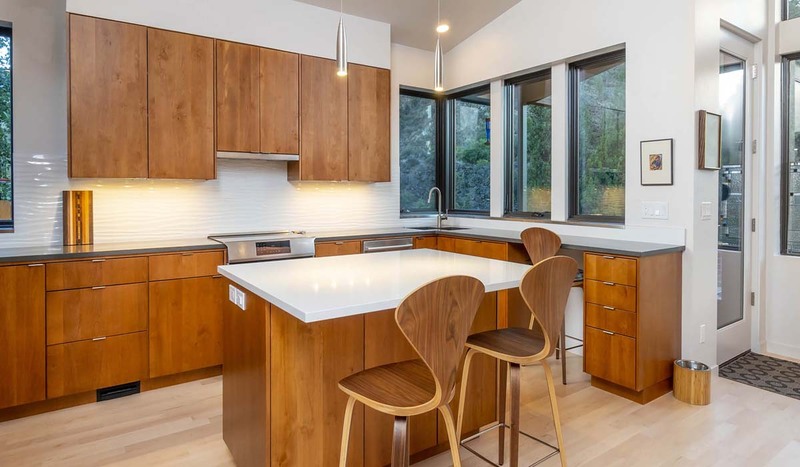 In addition, the home’s ceiling consists of “rediscovered” redwood—wood passed over as scrap when the area was first logged, later reclaimed and rescued from the forest floor. “I’m a believer in conserving resources,” Rowe notes. Sealants: Low- to no-volatile organic compound (VOC) sealants: DAP DynaGrip, Dynaflex and ALEX Plus products for subfloor, deck, windows, doors; Touch ’n Seal spray foam insulation for electrical and HVAC penetrations. 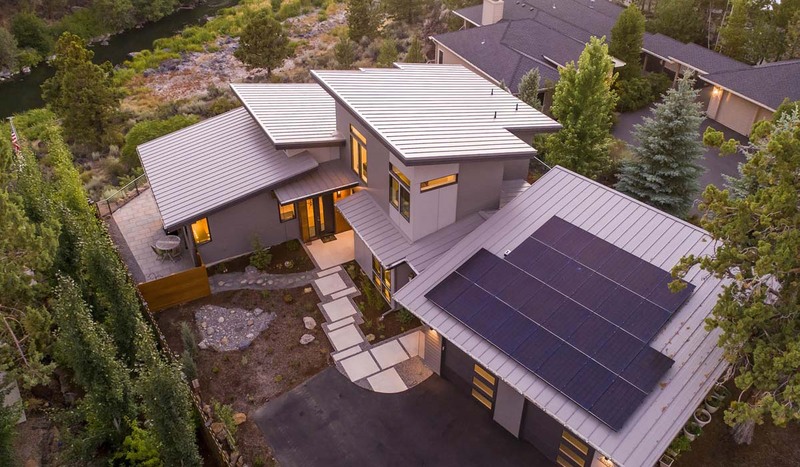 More than two dozen solar panels perched on the standing seam metal roof fully power up the Rowe-Toogood home during the day. 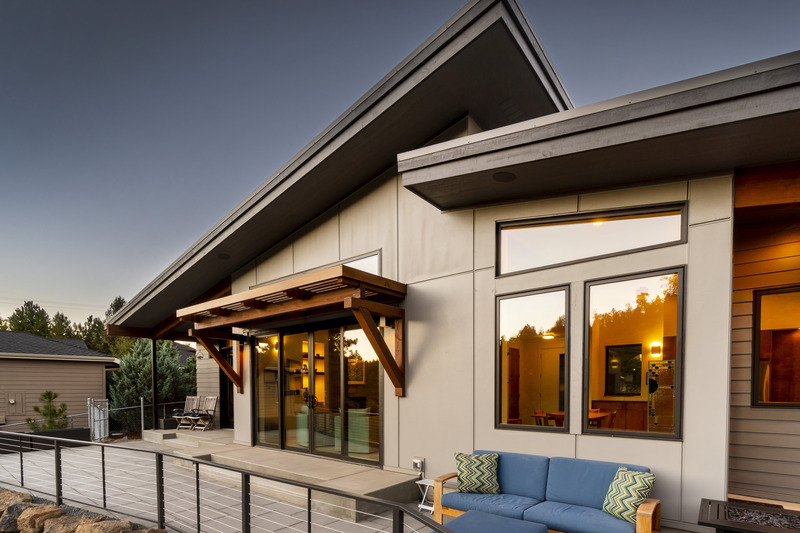 High-density, triple-pane glass and fiberglass doors act as internal environment and sound control agents. Nothing unnatural here. 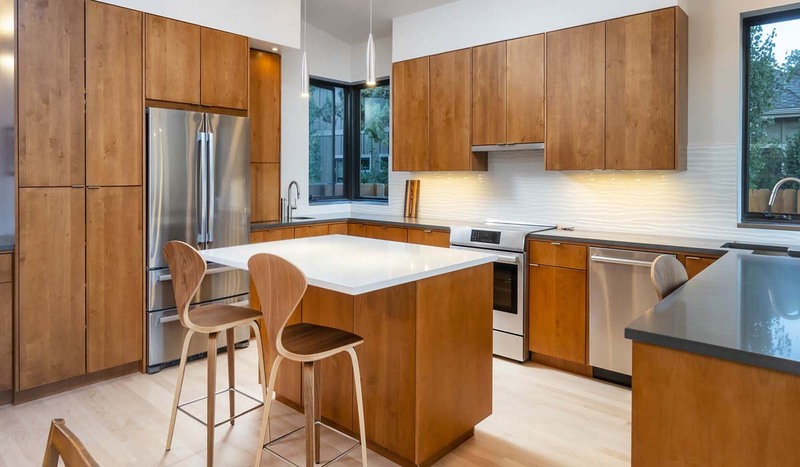 Cabinets throughout the house include fronts made of solid, formaldehyde-free Alder, a locally grown product. 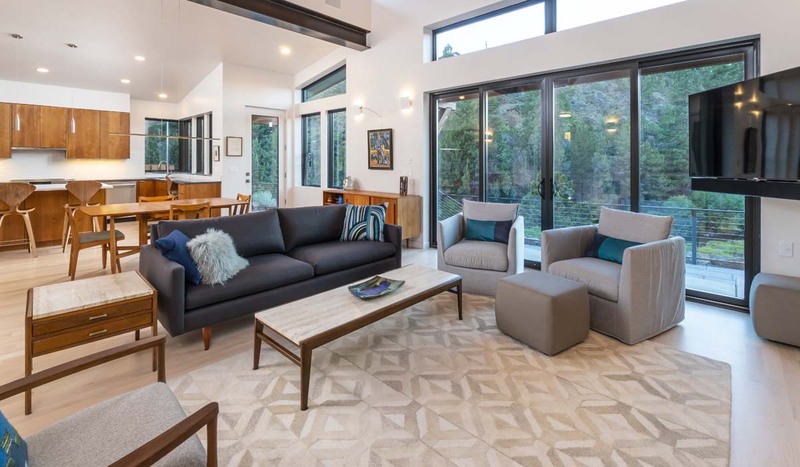 The house features a selection of wood, stone and naturally sourced fabrics and fibers in and on top of its floors. A Mitsubishi mini-split heat pump keeps hot or cold clean air easily circulating when needed.